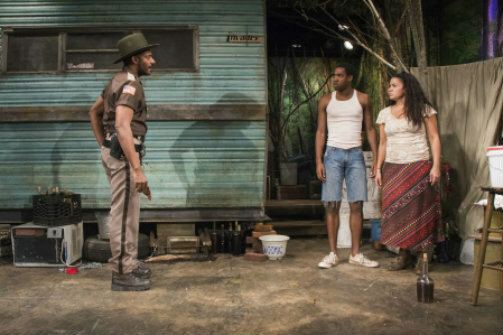 Billy Eugene Jones, Maurice Williams, and Yvette Ganier in Pitbulls. Photo by Monica Simoes. BOTTOM LINE: A heartfelt thriller depicting the darker sides of human nature which goes to show that we're all simply animals on two legs. If you are ever walking on a nature trail in Appalachia and lose your way, you might stumble upon the camping ground of Mary (Yvette Ganier). She and her teenaged son Dipper (Maurice Williams) spend their days in seclusion while she concocts her homemade healing wine. It’s a paradise of Mary’s making. But try as she may, she can’t get away from the demons of her past, nor can she shut out the horrible cries from the town’s famous Pitbull fights. The township in rural Appalachia doesn’t offer much aside from tantalizing mountain views and a Walmart. The only options for a kid like Dipper are to join the Marines or carry on with the family trade. The townsfolk take special pride in their epic dogfights: it’s the only staple they have. In celebration of the Fourth of July, everyone is gearing up for an epic dogfight. For Mary, the fights are a painful reminder of her beloved Pitbull pup who was stolen and killed in a fight. Scarred and bitter, she takes to “homegrown terrorism” in defiance, burning American flags and ignoring all symbols of so-called independence. Rumor has it she once planted explosives in a stranger’s truck, nearly killing him. Needless to say, Mary and Dipper aren’t popular. They’re treated as backwoods outcasts. Despite her reputation, Mary is still pursued by new and old flames. Psychopathic sheriff Virgil (Billy Eugene Jones) makes frequent check-ins, imposing himself as a creepy father figure for Dipper. Mary and Virgil have history together, but all that changed when Virgil returned from the Marines with a sadistic twist. Mary wants nothing to do with him, and Virgil can’t take the hint. Mary’s other courter is Wayne (Nathan Hinton), a minister who’s been head over heels for her ever since she saved him from his drunken, debaucherous past. The only problem is, he’s married to a very pregnant and impatient Rhonda (Donna Duplantier). Adkins’s characters glitter with passion. It’s not so important whether their intentions are genuine. The line between Good and Evil is constantly tested. With director Leah C. Gardiner, the tiny bubble of the play’s world encapsulates the audience. This is also in large part due to Andrew Boyce’s transportative set design. Throughout the play I was riveted by a sense of danger and excitement that’s immediately evident in the first scene. Ganier and Williams’s depiction of a suffocated Mother/Son relationship is extraordinary to watch. Ganier in particular brings an invigorating ferocity to Mary. I loved her and rooted for her, even though she’s frightening and full of grandiosity. “Guess solitude don’t always make a thoughtful person,” she laments. “Sometime it creates monsters”. Pitbulls is a refreshing, darkly comic exploration of man’s bestial nature.